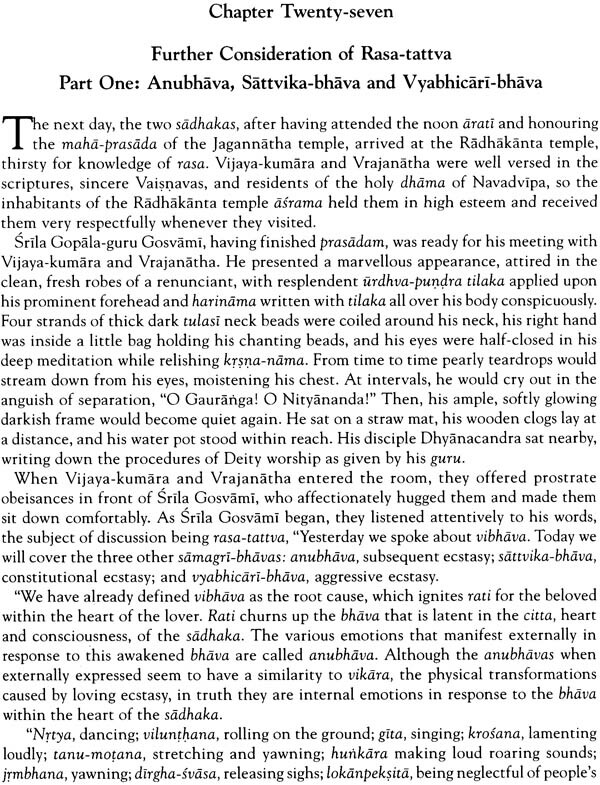 The Jaiva dharma of Srila Bhaktivinoda Thakura is one of the greatest waves in the nectar-ocean of transcendental literature that the Thakura gifted to this parched world lost in the desert of materialism. Completed in the Year 1896, it is recognized as a central work of Gaudiya Vaisnavism and an essential companion for the sincere aspirant to the highest levels of Krsna-consciousness. 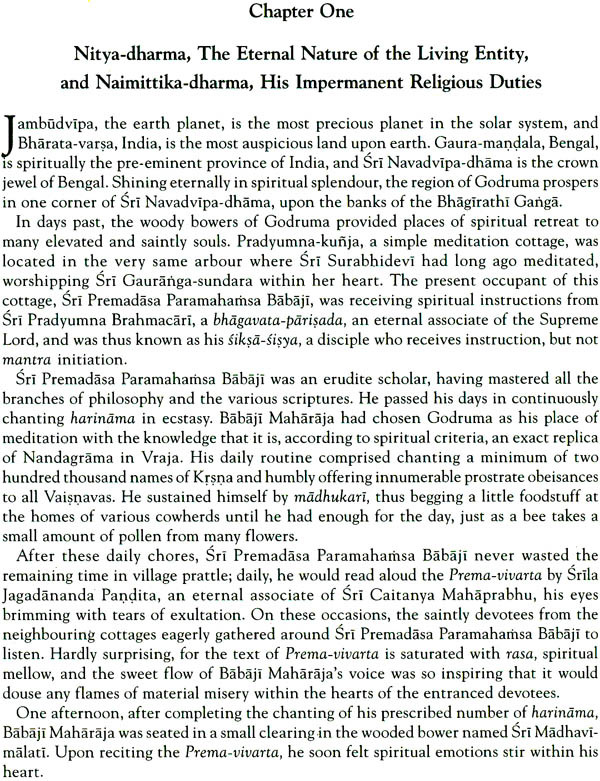 The book is set in Navadvipadhama, Sri Caitanya Mahaprabhu's birthplace, approximately one hundred years after His birth in 1486, and then moves on, as did the lila of Sri Mahaprabhu, to conclusion in Jagannatha Puri. The work is in the form of a highly entertaining novel, the central core of which is a series of dialogues between spiritual teachers and their disciples. There are also a number of debates on various topics between these teachers and antagonistic parties. 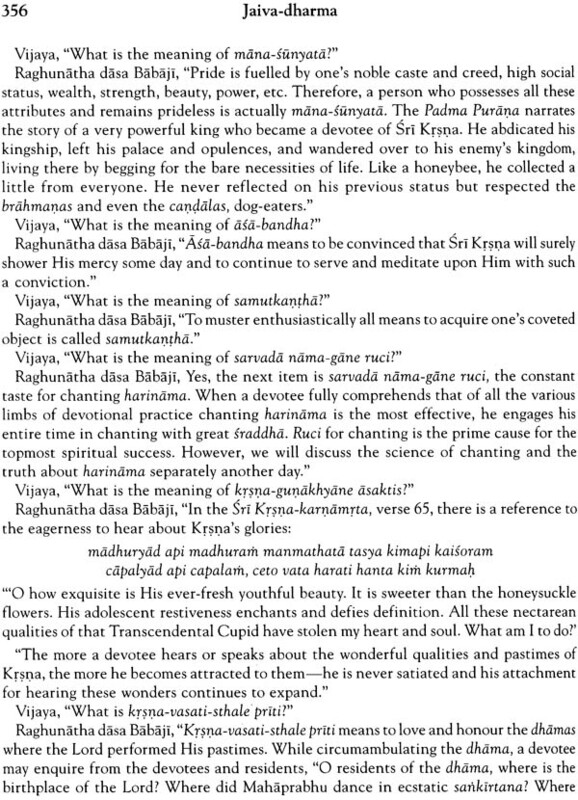 Within this format, Srila Bhaktivinoda brilliantly elucidates the philosophy practice and ultimate goal of transcendental life as taught by Kali-yuga-avatara Sri Krsna Caitanya Mahaprabhu. 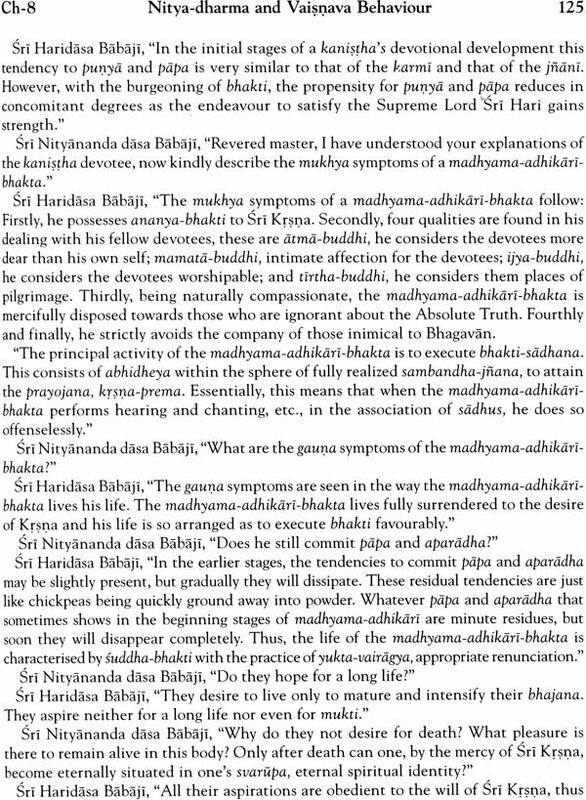 Those fortunate souls who wish to take shelter of the lotus feet of Sri Gauranaga Mahaprabhu, the deliverer from the ills of Kali-yuga, let them read this book with firm faith and heartfelt devotion thus discovering the most sublime transcendental treasure. In London, on the appearance day celebration of Srila Sac-cid ananda Bhaktivinoda Thankura, September 23, 1969, His Divine Grace Srila A. C. Bhaktivedanta Swami Prabhupada, the founder acarya of the International Society for krishna Consciousness, gave a lecture on the life and teachings of the Thakura. 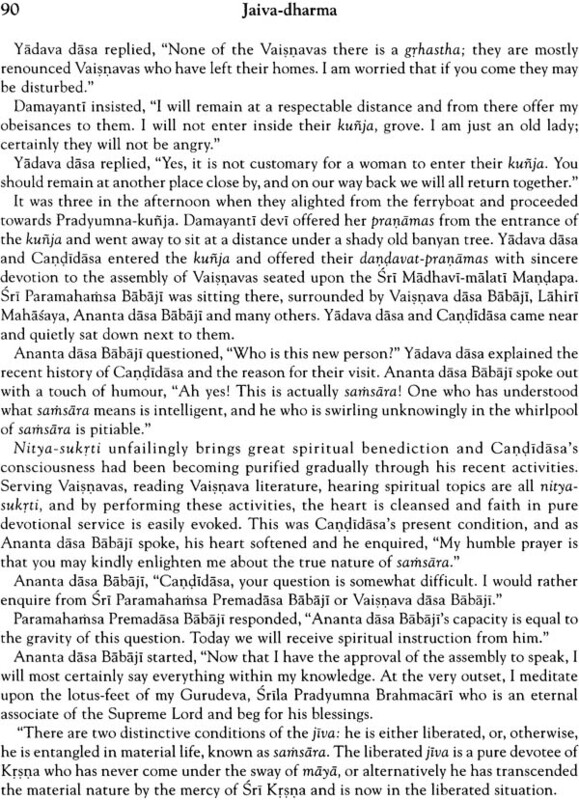 In the lecture, Srila Prabhupada explained: "So Bhaktivinoda Thakura happens to be an acarya, one of the acaryas. 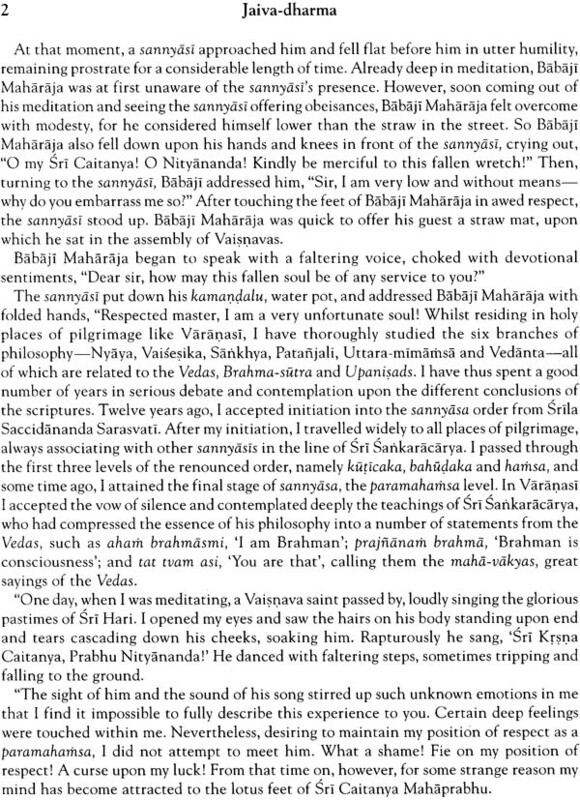 And he has left behind him many books – Caitanya siksamrta, Jaiva-dharma. These are very important books. They're in Bengali and Sanskrit ... .... 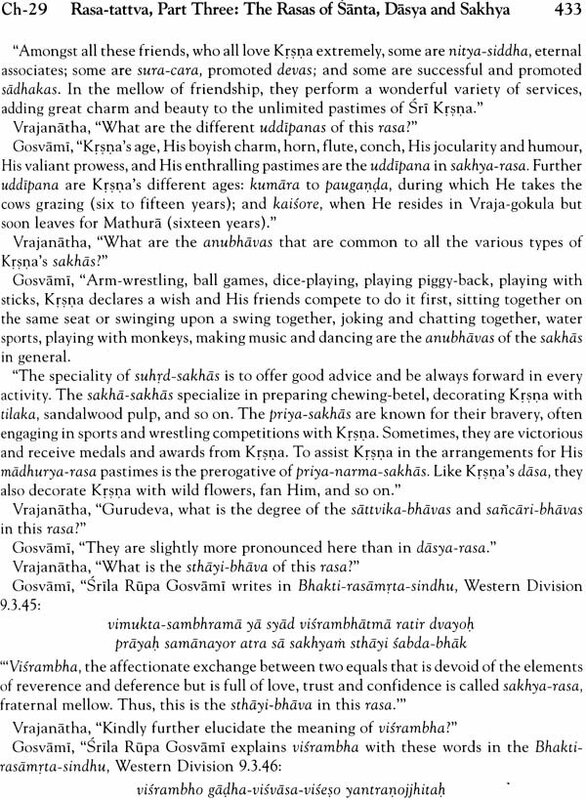 So we are trying to present Bhaktivinoda Thakura's books also in an English translation. Gradually you will get them. 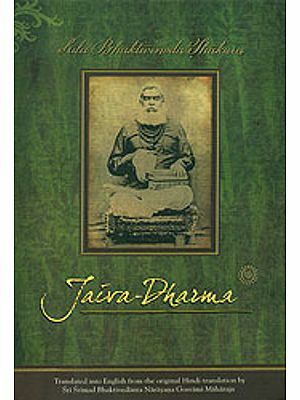 We are now most happy to fulfil the desire of Srila prabhupada with the Publication of this volume of Jaiva – dharma, in invaluable compendium of Gaudiya Vaisnava philosophy and practice, fully elucidating the intrinsic and essential function of the individual soul in the union of transcendental love with the Supreme Soul, Sri Krsna. Every effort has been made by the learned translator Sarvabhavana dasa to render the Thakura's original Bengali text into readable and literary English with the highest priority given to accuracy in translation. 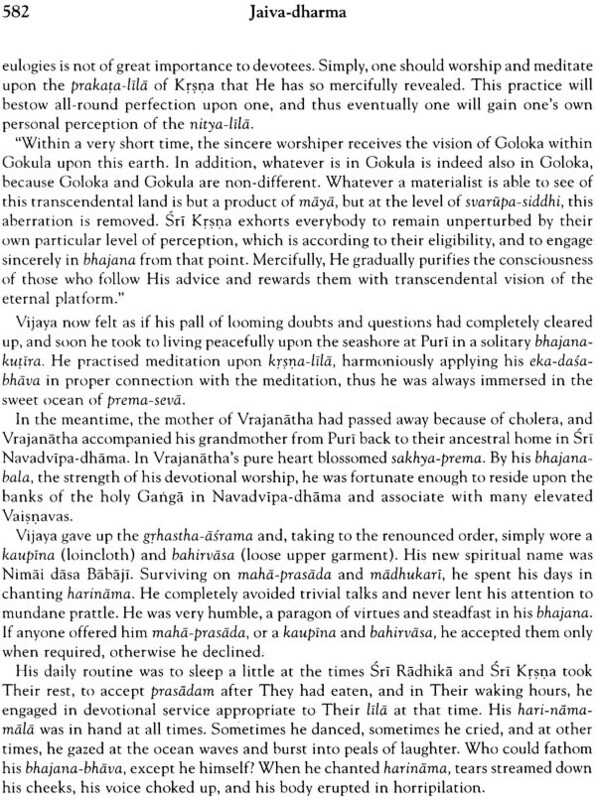 We pray that the learned and merciful Vaisnavas will forgive any shortcomings in our efforts and bless us to further fulfil the desire of Srila Prabhupada by publishing further works of Srila Bhaktivinoda. 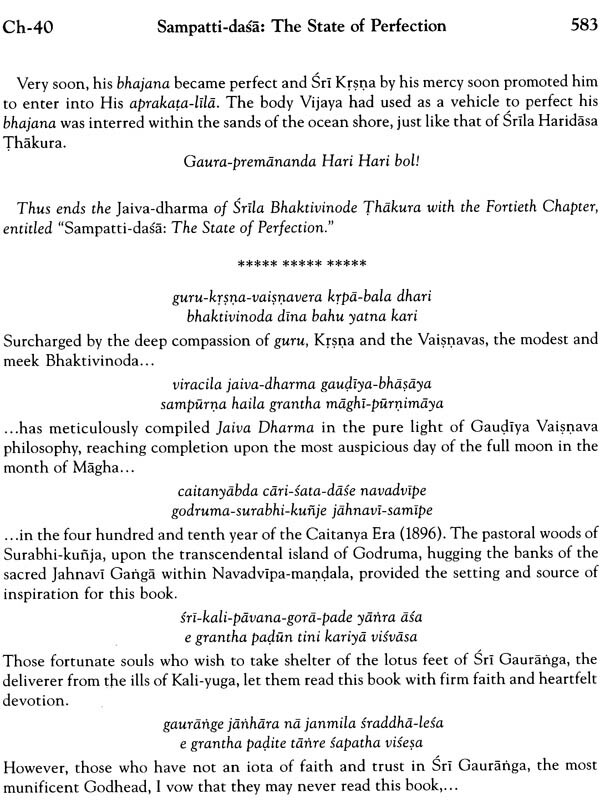 From the above statement we can plainly see that it is the desire of Srila Prabhupada to see the complete compendium of Srila Bhaktivinoda's Sanskrit and Bengali works Presented to his devotees in the English language. 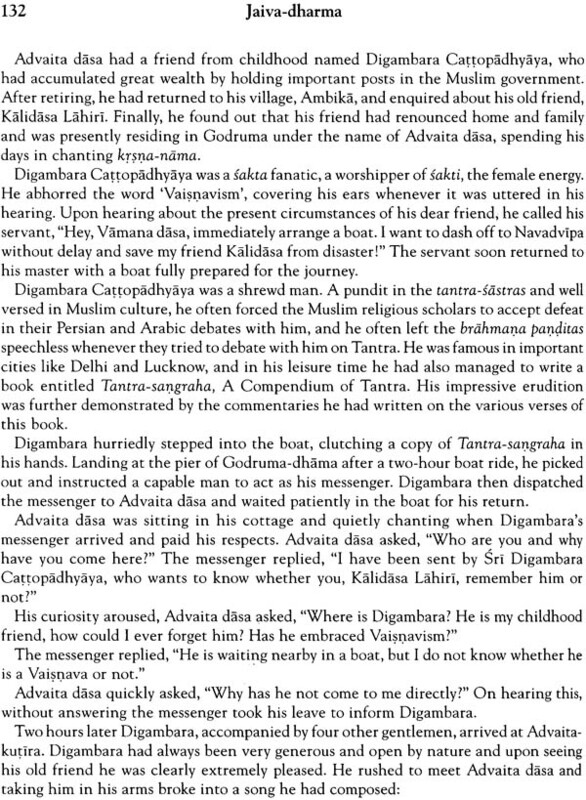 "Many devotees of Lord Caitanya like Srila Vrndavana dasa Thakura Sri Locana dasaThakura, Srila Krsnadasa Kaviraja Gosvami, Sri Kavikarnapura, Sri Prabodhananda Sarasvati, Sri Rupa Gosvami, Sri Santana Gosvami, Sri Raghunatha Bhatta Gosvami, Sri Jiva Gosvami, Sri Gopala Bhatta Gosvami, Sri raghunatha dasa Gosvami and in this latter age within two hundred years, Sri Visvanatha Cakravarti, Sri Baladeva Vidyabhusana, Sri Syamananda Gosvami, Sri Narottama dasa Thakura, Sri Bhaktivinoda Thakura and at last Sri Bhaktisiddhanta Sarasvati Thakura (our sprirtual master) and many other great and renowned scholars and devotees of the Lord have prepared voluminous books and literatures on the life and precepts of the Lord. Such literatures are all based on the sastras like the Vedas, Puranas, Upanisads, Ramayana, Mahabharata and other histories and authentic literatures approved by the recognized acaryas. They are unique in composition and unrivalled in presentation, and they are full of transcendental knowledge. 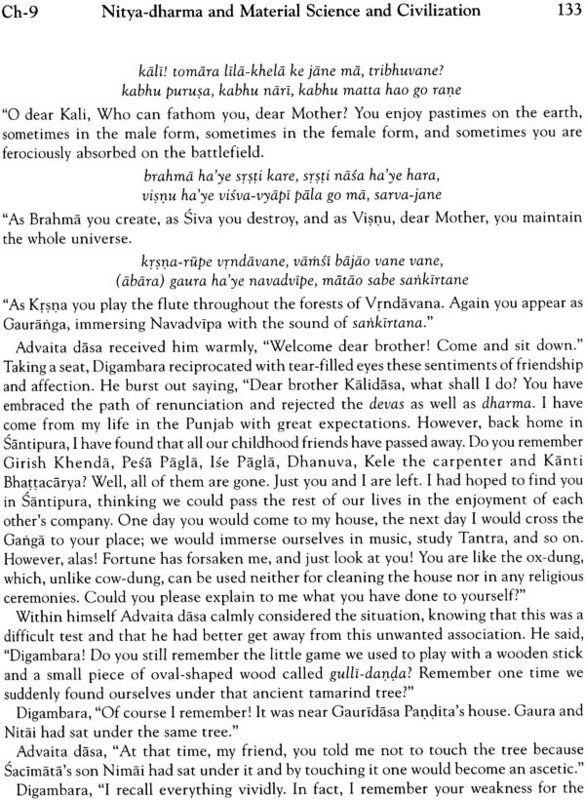 Unfortunately the people of the world are still ignorant of them, but when these literatures, which are mostly in Sanskrit and Bengali, come to light the world and when they are presented before thinking people, then India's glory and the message of love will overflood this morbid world, which is vainly searching after peace and Prosperity by various illusory methods not approved by the acaryas in the chain of disciplic succession. "This our book distribution, is the most important task in our society. Therefore I am giving so much stress and I am working so hard on this. Because this is my life and soul according to the order of my Guru Maharaja. And by his grace it is to some extent successful. And i took it seriously. I take it seriously still now. That is my life and soul." 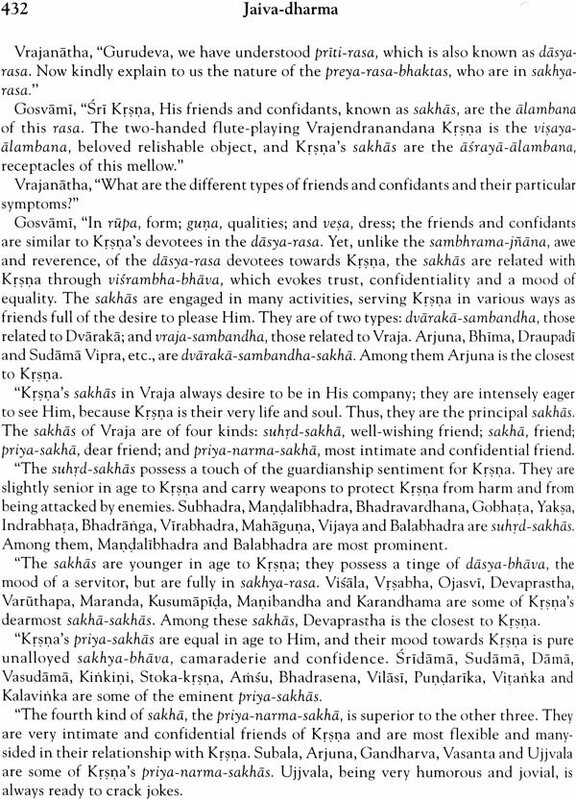 This book, Jaiva dharma, is the guide and life –companion for those fortunate and devoted souls whose hearts yearn to attain the highest platforms of krsna-prema. 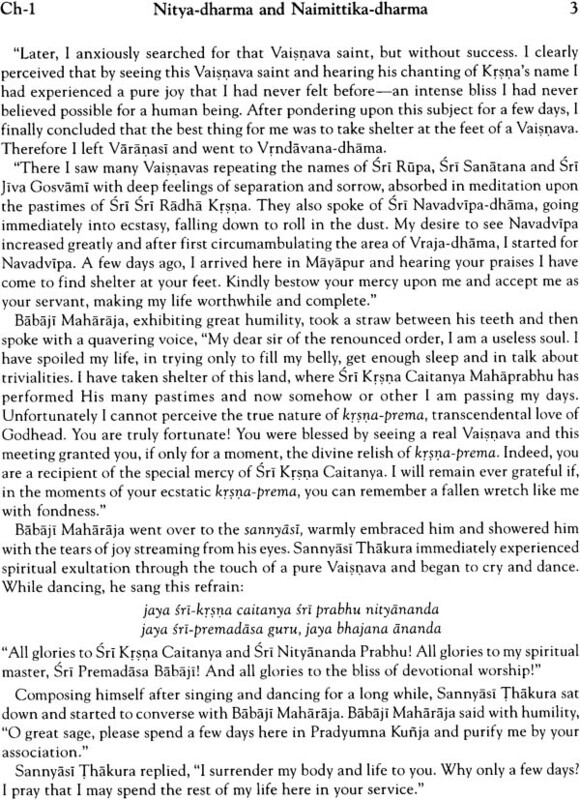 As such, it is the ecstatic endeavour of the author, Srila Bhaktivinode Thakura, to fulfil the desire of his beloved Lord, Sri Krsna Caitanya Mahaprabhu, that the fallen souls be liberated from the miserable illusions of material life to taste eternally the nectar of krsna-prema. 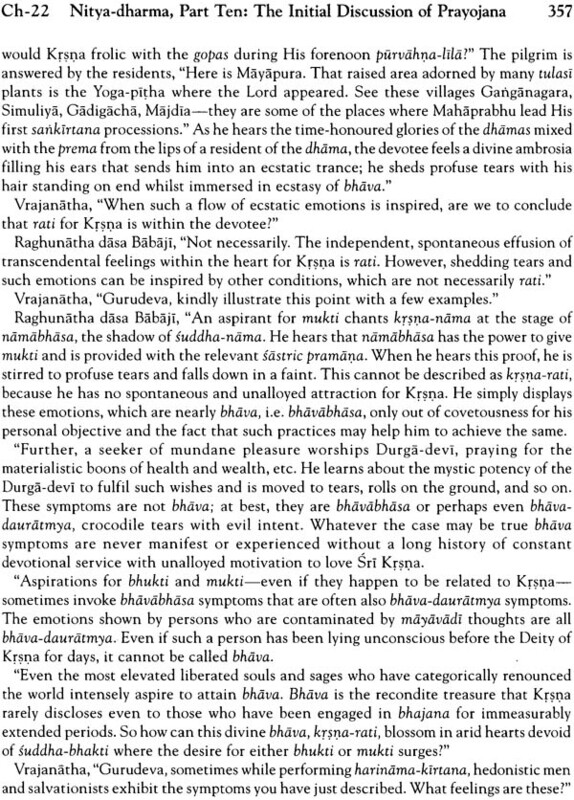 The esoteric subject matter of this is not for the stubbornly faithless non-devotees of the supreme Lord. Guileless faith is the sole doorway to the transcendent treasures within these pages. After the final chapter in his concluding words, The Thakura wirtes, Those fortunate souls who wish to take shelter of the lotus feet of Sri Gauranga, the deliverer from the ills of Kali-yuga, let them read this book with firm faith and heartfelt devotion. However, those who have not an iota of faith and trust in Sri Gauranga, the most munificent Godhead, I vow that they may never read this book, for the dry empirical philosophers aspiring for liberation will never see the Supreme Personality of Godhead, Sri Krsna, the ultimate spiritual goal. However, the faithful devotee is surely crowned with success as he worships and serves the pure transcendental pastimes of Vraja within his heart. 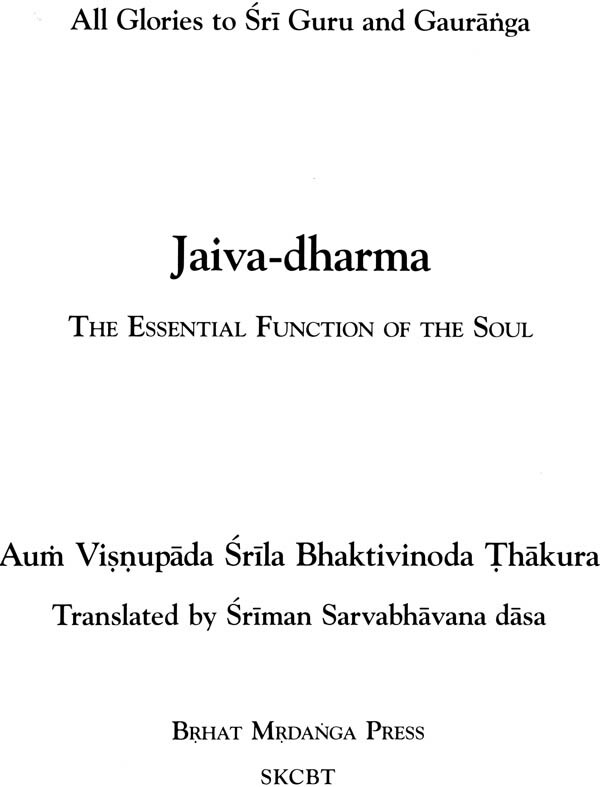 "By regularly studying this book, jaiva-dharma, one develops pure devotion. 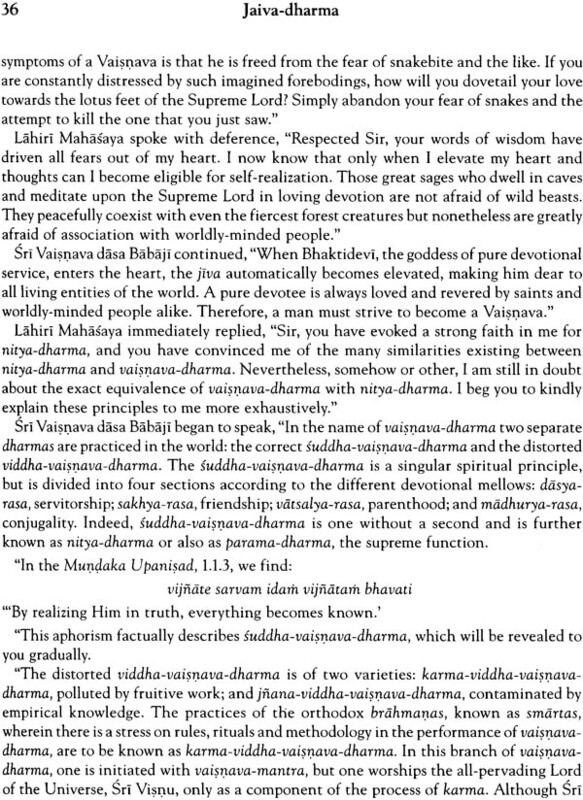 However, by not reading this book, one deprives oneself of the opportunity to tread the path of pure devotion. 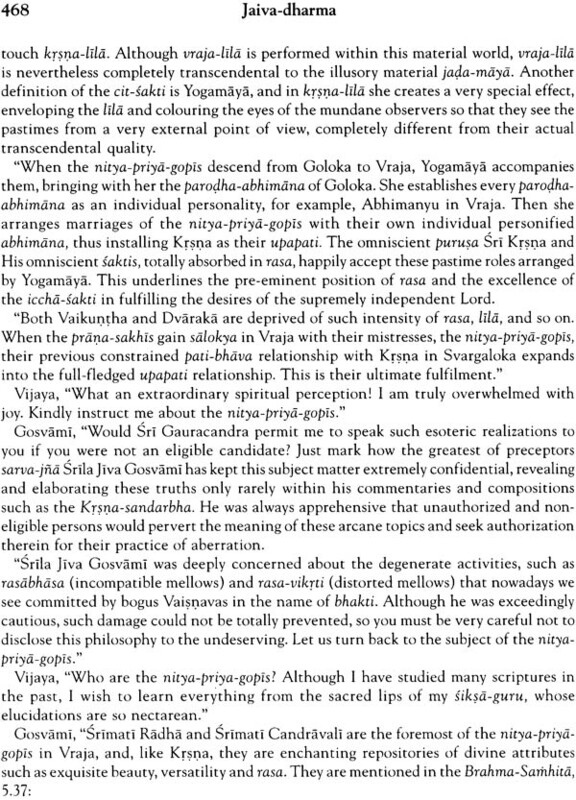 Reading Jaiva-dharma surely increases one's commitment to rupanuga-bhakti, the path of bhakti as enunciated by Srila Rupa Gosvami. 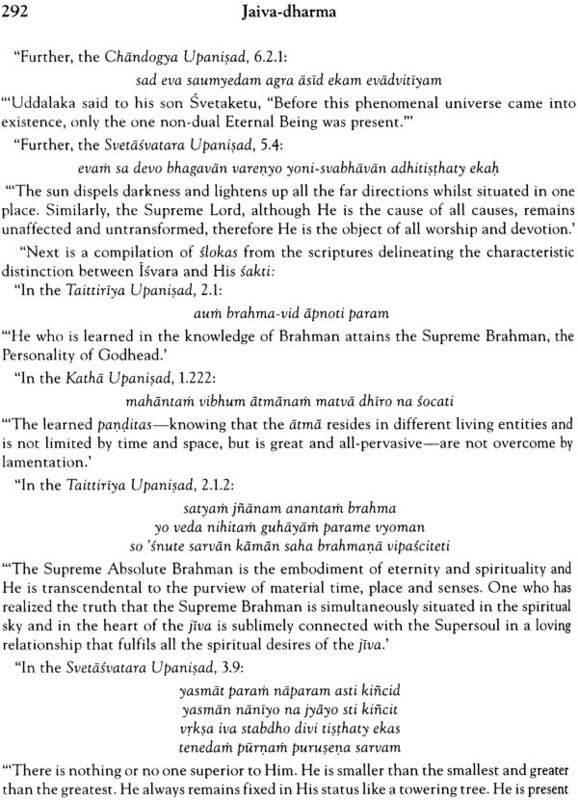 However, one who refuses to read this book is indeed faithless and devoid of dharma. 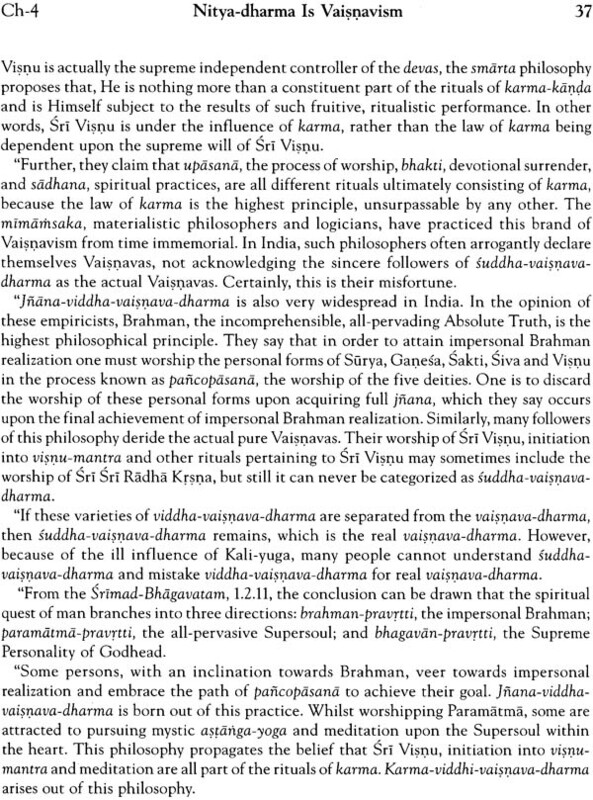 The faithful person who makes Jaiva-dharma his life-companions and guide will realise without doubt that false prestige, empirical knowledge and fruitive activity are all worthless. Such a soul is rewarded with pure devotional service to Sri Krsna, thus remaining eternally absorbed in satisfying Krsna and relishing the unlimited bliss of His seva. 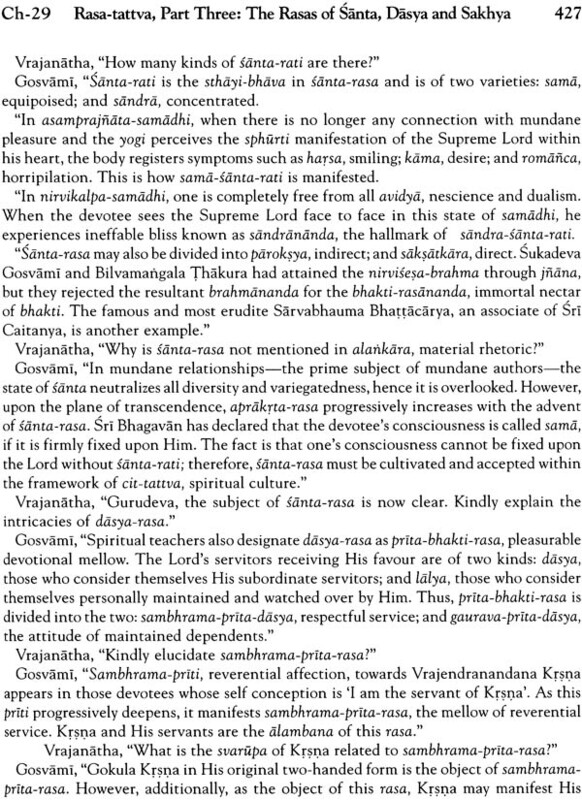 In Chapter Two, the Thakura defines jaiva-dharma, "The unblemished pristine love for the Supreme Absolute whole experienced by the minute particle of spiritual substance-the jiva is defined as jaiva dharma." To bestow this unblemished krsna – prema, transcendental love of the Supreme Personality of Godhead, upon the fallen souls of the material creation was in part, the mission of the Golden Avatar, Sri Krsna Caitanya Mahaprabhu. 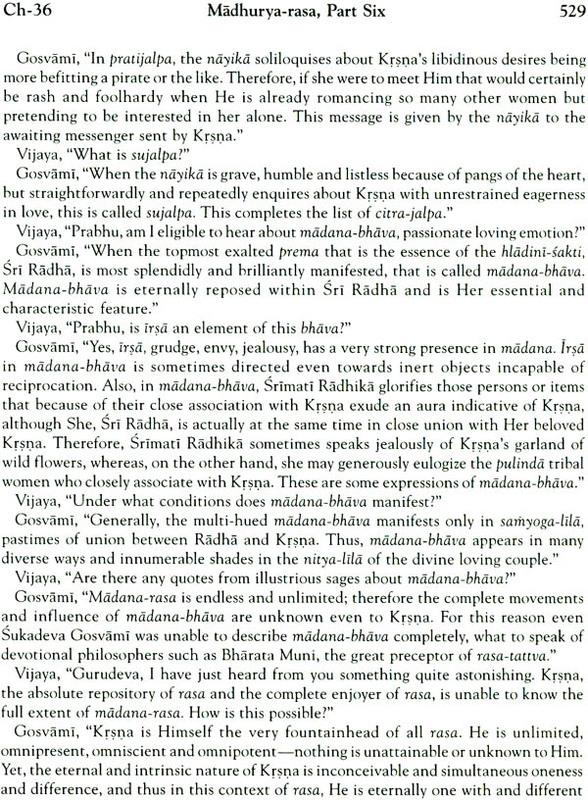 Ecstatic love is the intrinsic nature of the relationship between the all-attractive Supreme Person, Sri Krsna, and His dear eternal servants, the Jivas, the individual souls. 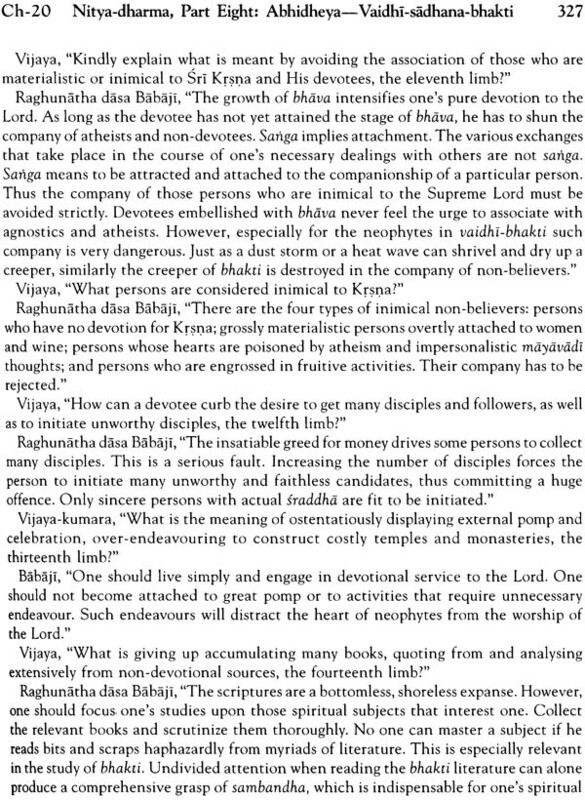 However, just as the unlimited Lord is supremely independent, the tiny jivas, partaking of his nature, are minutely independent. The free exercise of this minute independence is a prerogative bestowed by the merciful Lord upon his servants and finds its defining characteristic in the choice between selfless service to the lord and selfish service by the jiva to his own self. 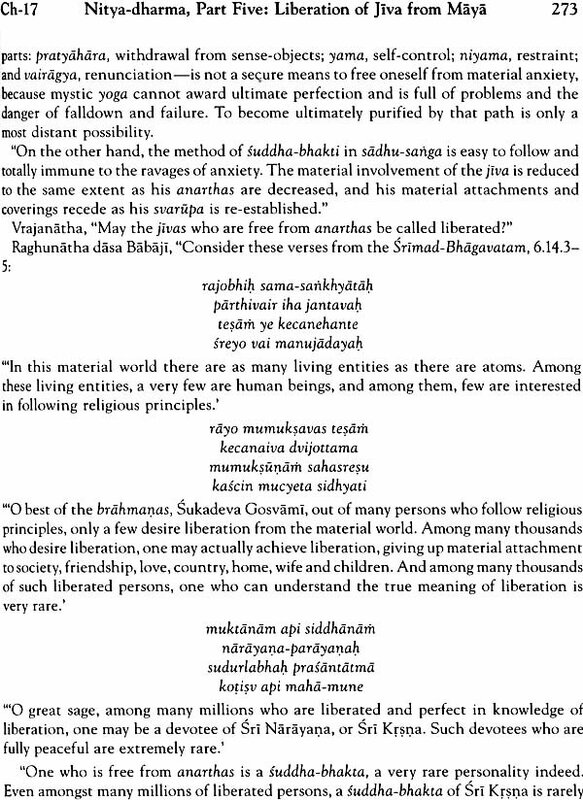 These mutually exclusive alternatives define the subsequent spheres of activity of the Jiva. Those fortunate souls who surrender to the Lord live eternally under the shelter of His internal spiritual energy, engaged in His ecstatic pastimes with hearts that know only pure transcendental love. Evern attentive to the satisfaction of the Lord and their fellow servants they eternally perceive and interact with Him and his associactes, immersed in unlimited intoxicating happiness. 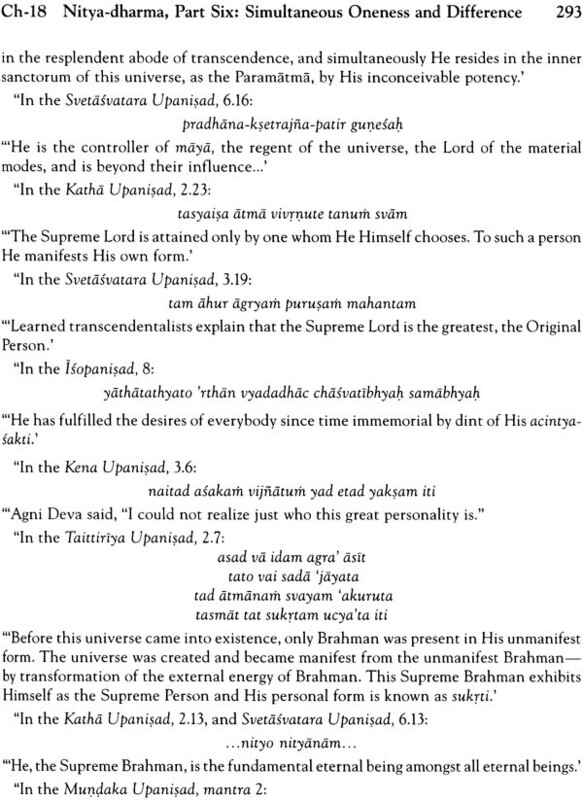 They attain their innate constitutional relactionship with the Lord as His transcendental servants, friends, parental figures and conjugal lovers; thus their jaiva-dharma, intrinsic nature, of ecstatic attachment to godhead finds unrestricted expression in the union of love with the Lord in His transcendental abode. The same cannot be said for those souls who reject the Lord and His service for them there is no station in the spiritual world. Mayadevi, the great mistress of the mundane universes manifested by the external material energy of the Lord, beckons such souls and covers their spiritual nature with the cloth of the subtle mental body and the outer dress of the gross material body. Now forgetful of the Lord and their natural spiritual relationship with him, they are subjugated by the illusory potency and consider themselves a product of the inferior material nature. In a mood of rebellion against the supremacy of the Lord and thereby their own innate spiritual constitution , they consider their self to be the external material body and items in relationship to the body to be their rightful possessions. With such false conclusions, fear and anxiety pervade their consciousness as they consider death to be the inevitable all devouring end; thus they launch into material life attempting to control and enjoy before the final curtain falls. Pushed and pulled by repulsion and attraction in the alien environment of the mundane energy, in bewilderment they foolishly fear no sinful activity and become increasingly mad after material enjoyment. However, they are bound by the laws of karma, and when the time comes their particular mixture of pious and impious activity defines next arena of attempted material enjoyment: They find themselves reborn in another material body. Thus, their karmic reactions sometimes heave them up to paradise in the higher more subtle material planetary systems or sometimes throw them down to Hell. Ignorant of their previous births, the forlorn jivas rotate ceaselessly through the multifarious bodies of the lower material creation. Sometimes they attain birth as human, sometimes as an animal sometimes as a tree, and sometimes as an insect. 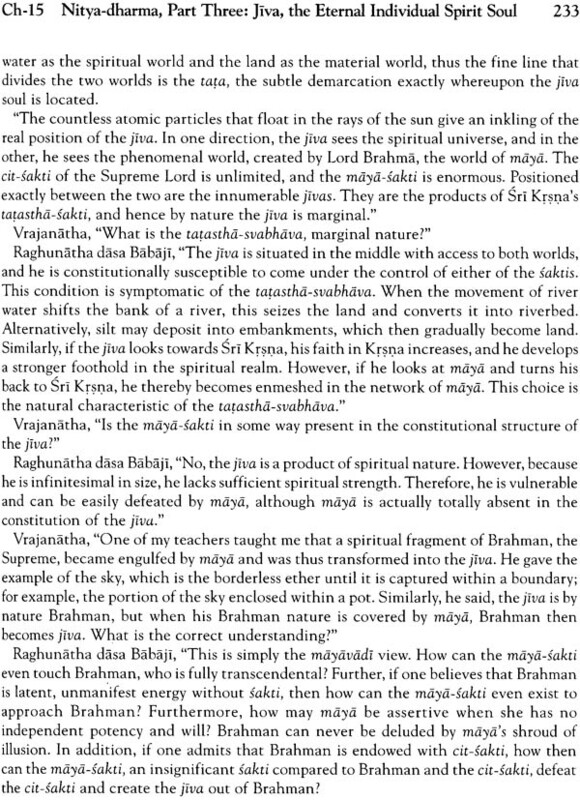 Attaining rebirth within a human body, the jiva may enquire into the ultimate truth of existence, but still harbouring a rebellious mentality, he becomes swayed by philosophies that deny service in surrender to the Supreme Personality of Godhead, Sri krsna. 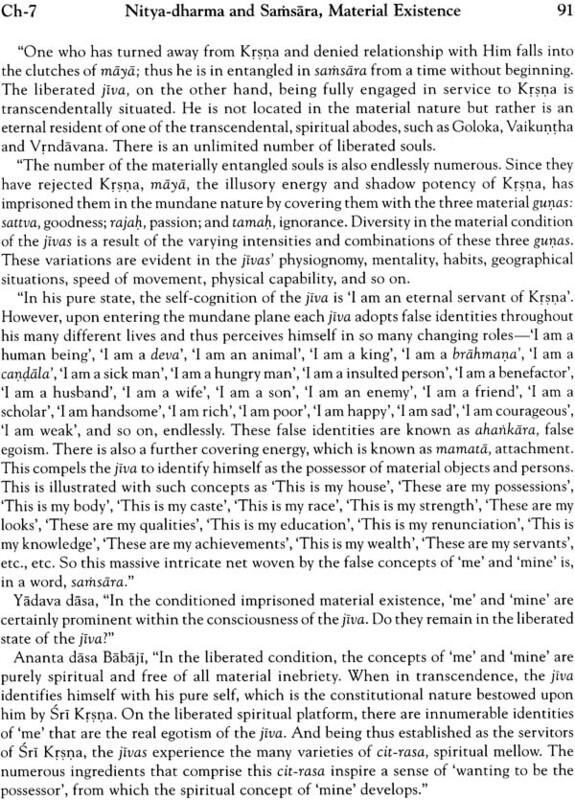 Lamentably, the jiva becomes absorbed in Voidism and Impersonalism, which define the infinitesimal jiva to be the ultimate and highest reality. 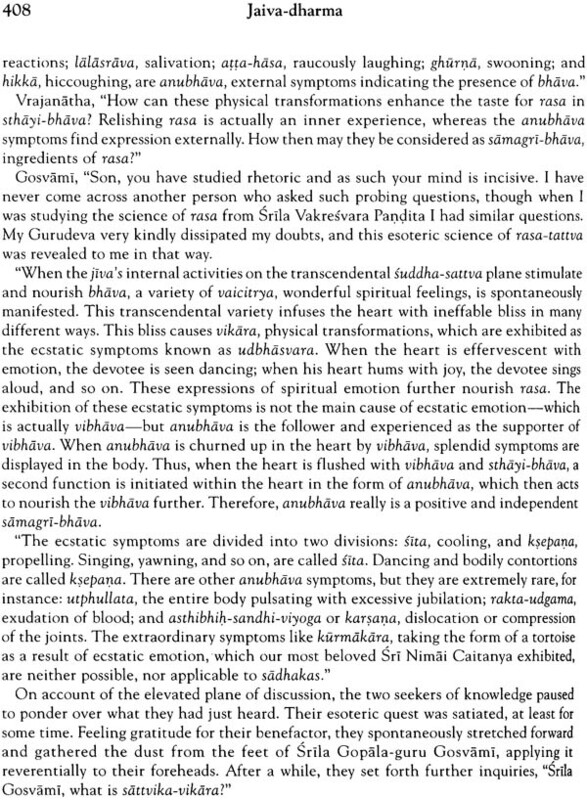 In such madness, the jiva offensively considers himself to be the Supreme – thus degrading himself even further than he did by his previous purely sensual pursuits. With misery and ignorance as his constant companions, the jiva continually sojourns throughout the practically unlimited species of material life. How may this cycle be broken? How may the jiva uncover the lost treasure within his heart? How may he uncover his dormant jaiva dharma eternal ecstatic krsna-prema, transcendental love of the Supreme Personality of Godhead, Sri Krsna. To answer these questions, Sri Krsna descends periodically from the spiritual realm, either in His original form or in the form of one of his multifarious avataras, to manifest His pastimes within the prison house of His external material creation. 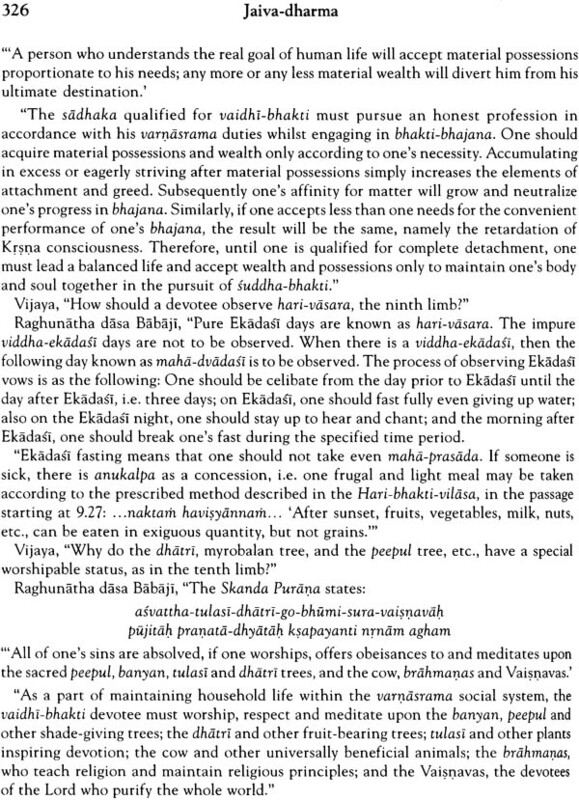 The Vedas, the grand handbooks of material and spiritual knowledge, inform us that time in the material world moves in a cyclic continuum of four ages known as yugas. The present age is known as Kali-yuga, beginning five thousand years ago when the highest manifestation of the Supreme Person, Sri Krsna returned to his spititual abode after displaying His pastimes of transcendence at Mathaura-Mundala, Indian. 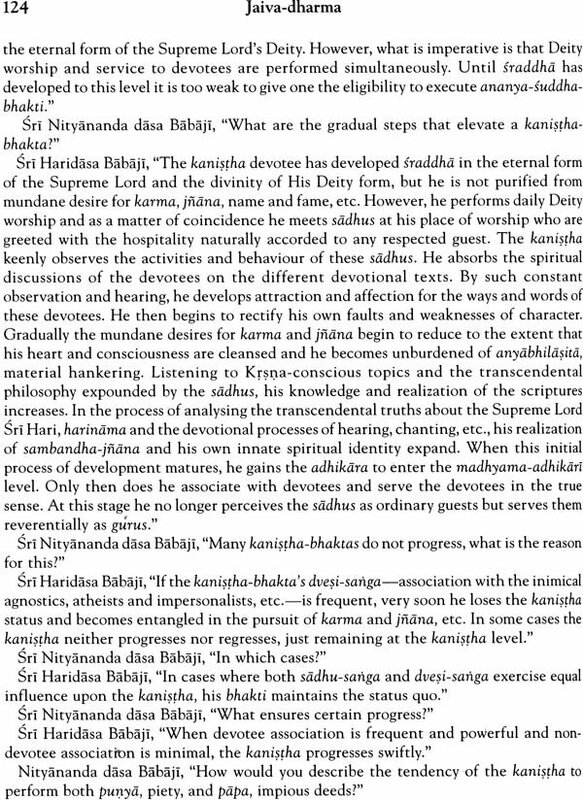 The material conditions vary with each yuga so in each yuga an avatara appears to teach the particular spiritual practice that is most efficacious for that age in uncovering the innate jaiva- dharma of the fallen souls. 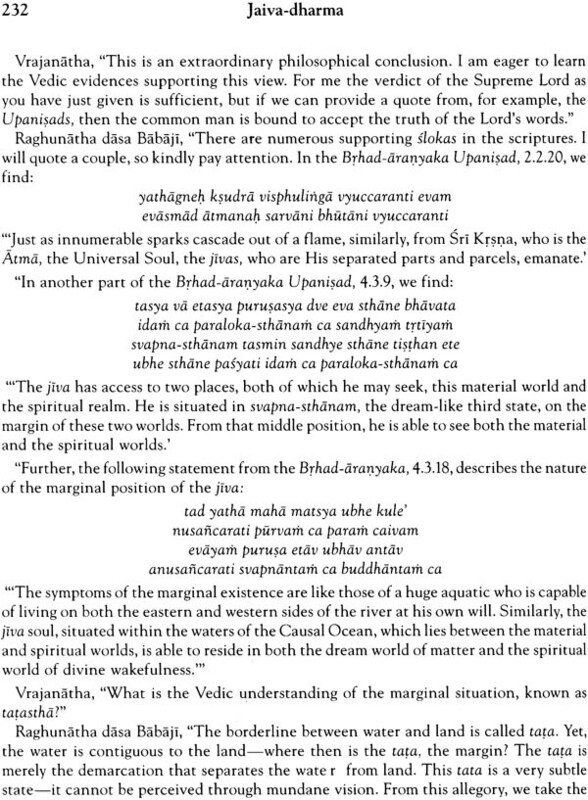 These divine manifestations are known as yuga-avataras.